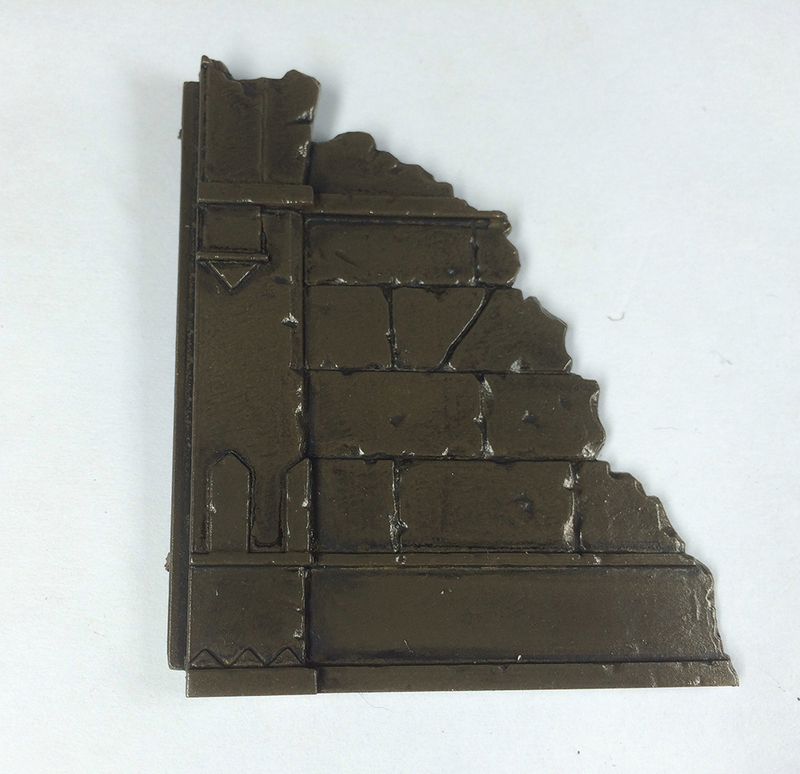 Oil washes were first primarily used by the scale modeling community on vehicles, but have somewhat recently gained popularity in miniature painting. Unlike traditional washes, oil washes give you plenty of time to fix your mistakes. The traditional mini painting process typically involves painting, washing, and then painting the same color again just to clean it up. Oil washes in many ways simplify this process. The first step of oil washing is varnishing the model. This is done primarily to protect the paint underneath from the solvents that you are about to apply. In addition, the type of varnish can also affect the way the oil wash behaves. Before applying the varnish, make sure that the paint it is being applied to is completely dry. 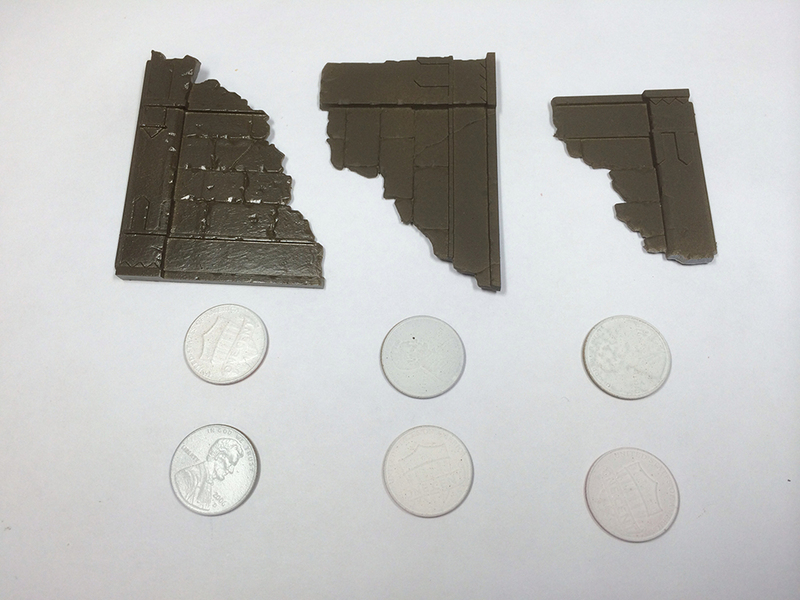 Applying varnish to a wet model can cause strange behavior and complications. Luckily most miniature painters use primarily acrylic paints which dry very quickly. Here I have a variety of subjects in an effort to show off some different effects and properties. Each group consists of a ruin and two coins. The groups were varnished gloss, satin, and matte respectively from left to right. After the varnish is applied it needs to thoroughly dry before proceeding. Even though a varnish may appear dry, it may not have cured completely. If you impatiently proceed you may find that the washes stain more than normal as they seep into the varnish. Different varnishes have different dry times, but I’ve found that the Vallejo varnishes provide good results after four hours and exhibit oil wash staining at less than two hours. Some varnishes take 24 hours, so do some research or proceed with caution. When you’re ready to start you can mix up your oil wash. For this you’ll need an oil paint and a solvent. There are a few different solvents for oil, but for our purposes “white spirits” aka “mineral spirits” work well. Unlike other options, it doesn’t attack the varnish aggressively and has a reasonable drying time. This can be found at art stores and hardware stores. Supposedly art grade is more pure, but I have trouble telling the difference and the price difference is substantial. The fumes that mineral spirits emit aren’t something you want to be heavily exposed to, so work in a ventilated area. Some brands offer “odorless” mineral spirits which at first glance seem like a safer option, but they aren’t. Odorless spirits are just as harmful, but your sense of smell helps you gauge how much of it is reaching you. That being said, if you are very sensitive to the smell you may opt for it. On a side note, a brush will be needed to mix the ingredients, as well as apply them later. Because of the nature of the solvent, a synthetic brush is best used for this. Natural hairs such as sable will be ruined quickly. In addition, it’s best to have brushes that you’ve designated only for oil use since you don’t want oil getting into your acrylics. 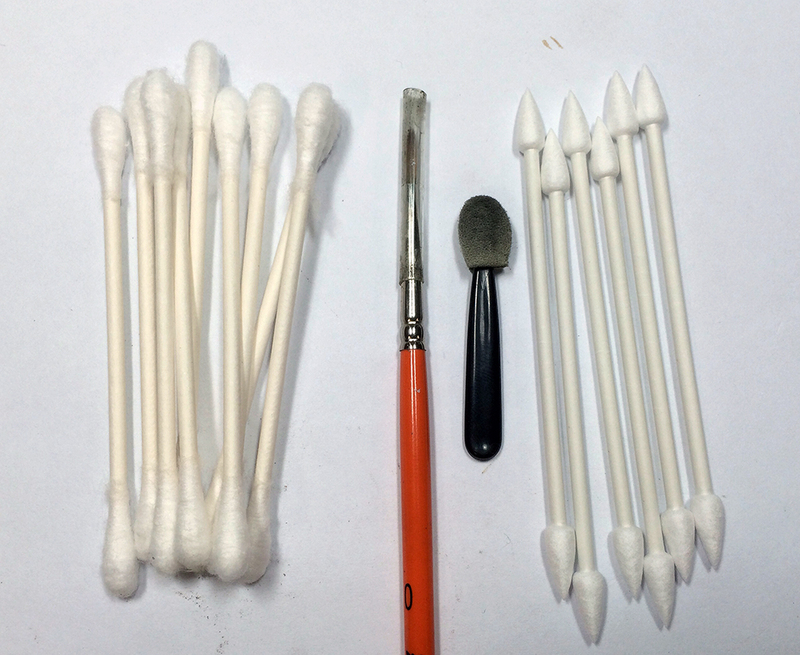 This brush can be cleaned with the solvent and brush conditioner can be used after use. Only a small amount of oil paint is needed to make an appreciable amount of wash. A tube will last a very long time. Food or medicine serving cups can be very handy for mixing. Originally I was using an artists palette and I found that it was a pain to clean. These cups are also useful for other painting techniques like airbrush thinning and alcohol paints. They can be found on amazon under a few searches (like “jello shots”), but “medicine cups” will usually find the best deal. Next I use a dropper to transfer the solvent into the cup and stir very well. A good 5-10 seconds of mixing is prudent. Since this mix tends to separate, it will be necessary to re-stir occasionally when applying. The question is often asked whether this mix can be stored for later use. It certainly can be, and certain companies like Mig sell washes pre-mixed. If you’ve made a special color that you want to reuse later it may be a good idea, but I rarely feel the need. I’ve heard anecdotal evidence that fresh washes work better, but I haven’t experienced much of a difference. The ratio of paint to solvent is not easily measured. 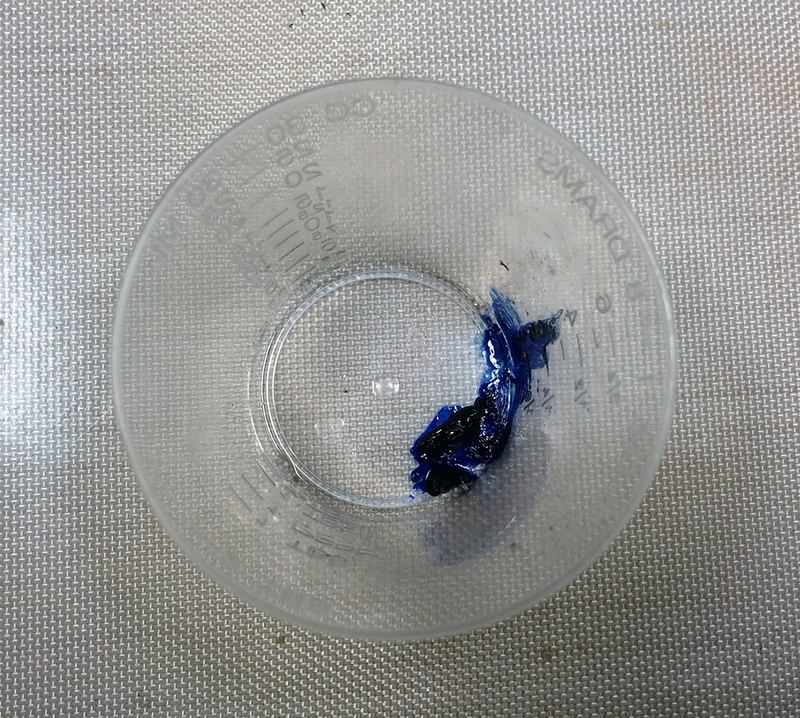 In addition to the paint coming out of a tube, different paints and solvents are not the same. For this reason I like to use a paper towel to judge if I have the mix right. After mixing lightly dab the surface and inspect the pattern. In the picture, the dab on the left is too thin. 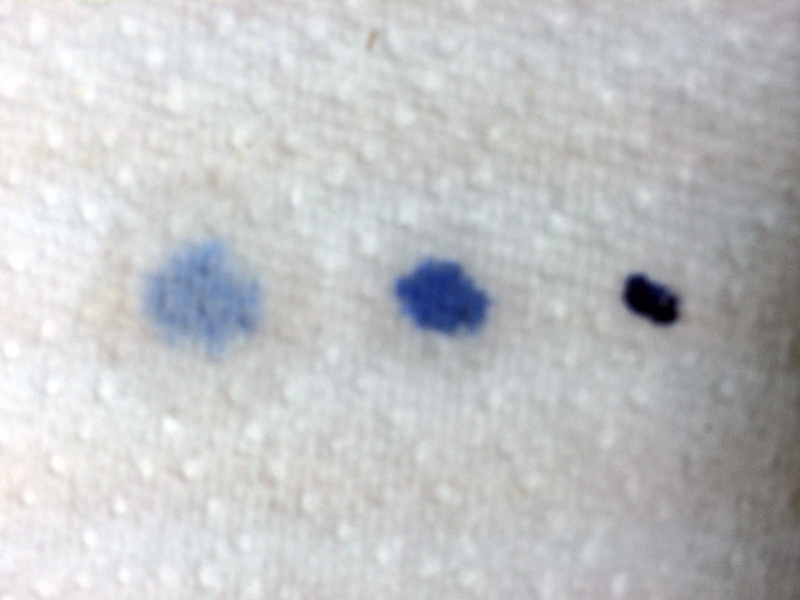 The color is faded and the mix is very dispersed. On the right the mix is too thick. The color is opaque and the mix hasn’t dispersed at all. The middle pattern is just right, with good saturation and some dispersal. When the wash is properly mixed it’s time for application. The first method of application is the mop method. 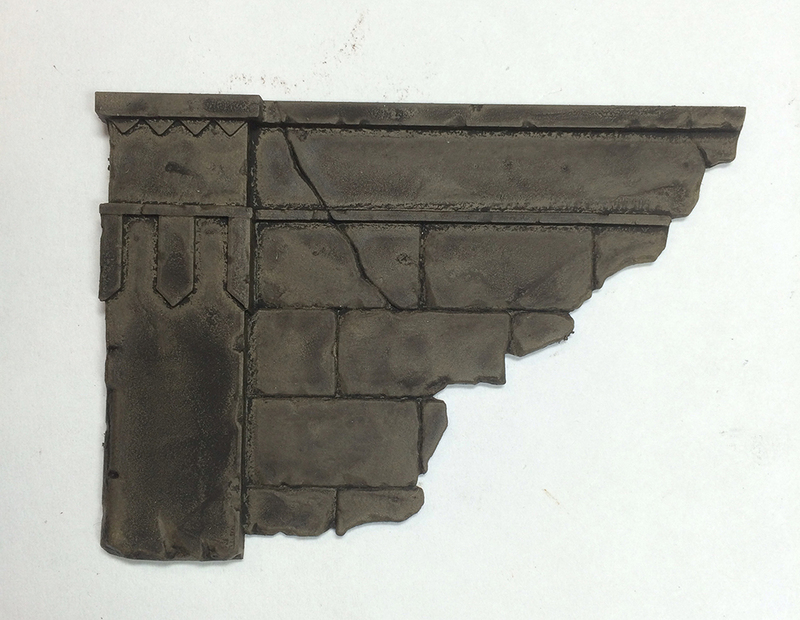 You simply load up the brush and mop it onto the model as shown above. This can work well for fur and chainmail. One of the drawbacks to the mop method is on flat surfaces it makes the wash exhibit some strange behavior. 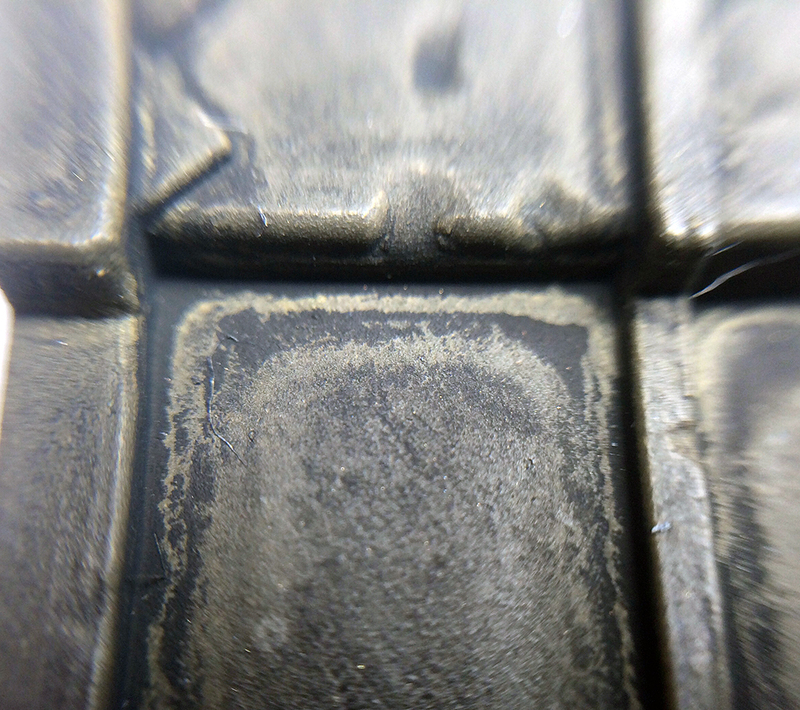 In this dried piece, you can see that the wash is in the crevice, but a strange void line region appears between the crevice wash and the surface wash. The other method of application is the pin wash, which is more of a finesse technique. Use the brush to dab into crevices. The capillary action should draw the wash out of the brush and into the crevice, hopefully filling it. This is not a stroking movement like normal painting. With experience you’ll learn to load the brush up with a certain amount of wash, and then tease it out onto the the crevice. If the brush is loaded too heavily the dab mark will be prominent, but too little wash won’t be enough to have the capillary action occur. 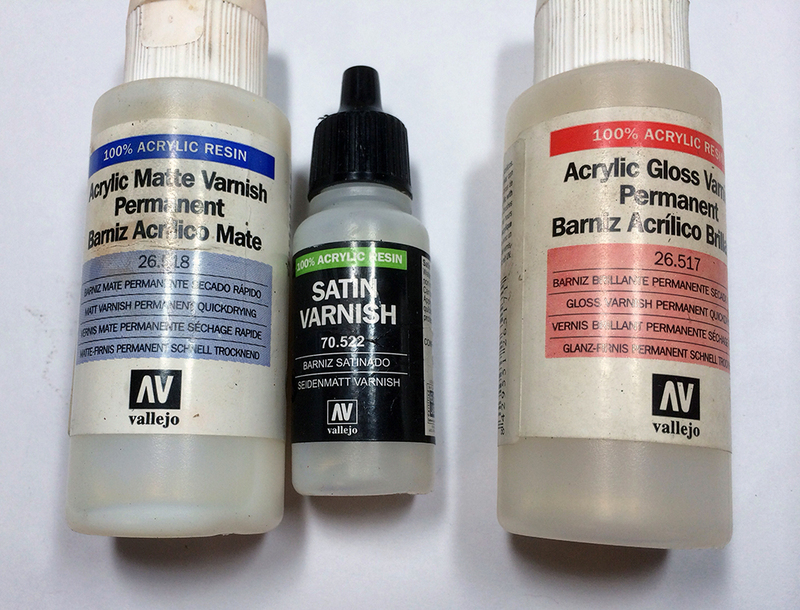 Both techniques of application will behave differently on the different types of varnish. 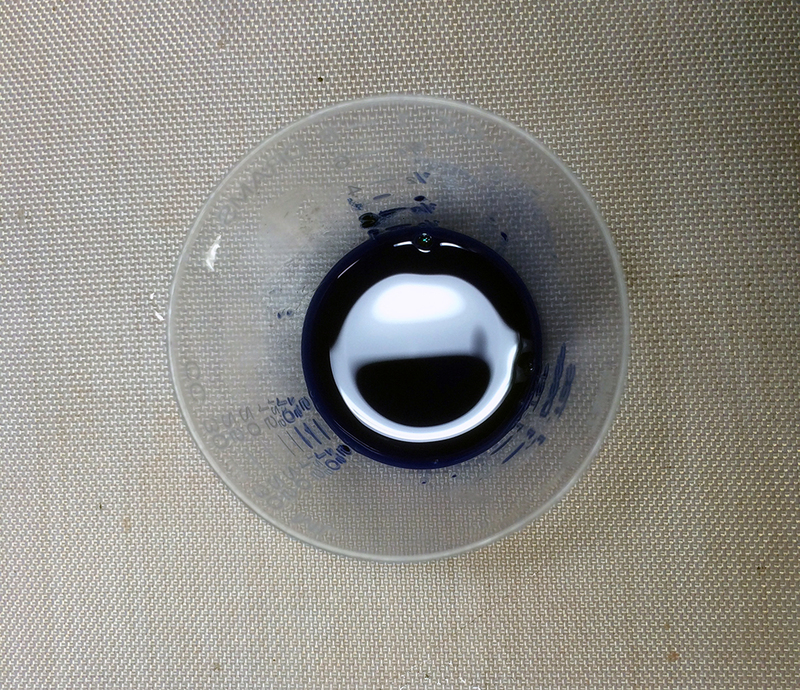 Matte varnish strongly inhibits the capillary action, making the wash typically sit where it’s applied. This behavior makes matte well suited for a filter effect, which is used to change a color rather than to bring out the shading detail. Gloss varnish, on the other end, is extremely slippery and you’ll find the wash seeks out the crevices. Unfortunately, the downside to this is when you want the wash to stay put it won’t. Washes over gloss will tend to pool at the bottom of the model, as the force of gravity alone is enough to pull the wash down. Finally, satin balances between gloss and matte, with properties in the middle. Before letting the wash dry, the first method of cleaning can be done. This simply involves using the brush to coax the wash into the places you desire. The brush can be loaded with solvent to clean or can be dry to absorb solvent. This can be difficult to control (particularly with gloss). You’ll often find that you end up accidentally cleaning areas that you wanted washed, then more wash needs to be applied, and then the cycle repeats. Because of this, wet cleaning isn’t normally the primary means of cleaning, but can be useful nonetheless. Once the wash is dry, other methods of cleaning can be used. A blow dryer can greatly speed up dry time, but be cautious with the heat. Generally, if the wash is dry to touch and is close to a matte sheen I find that it’s ready for the next step. Lightly dampen the tool and simply wipe the areas that you desire to be clean. 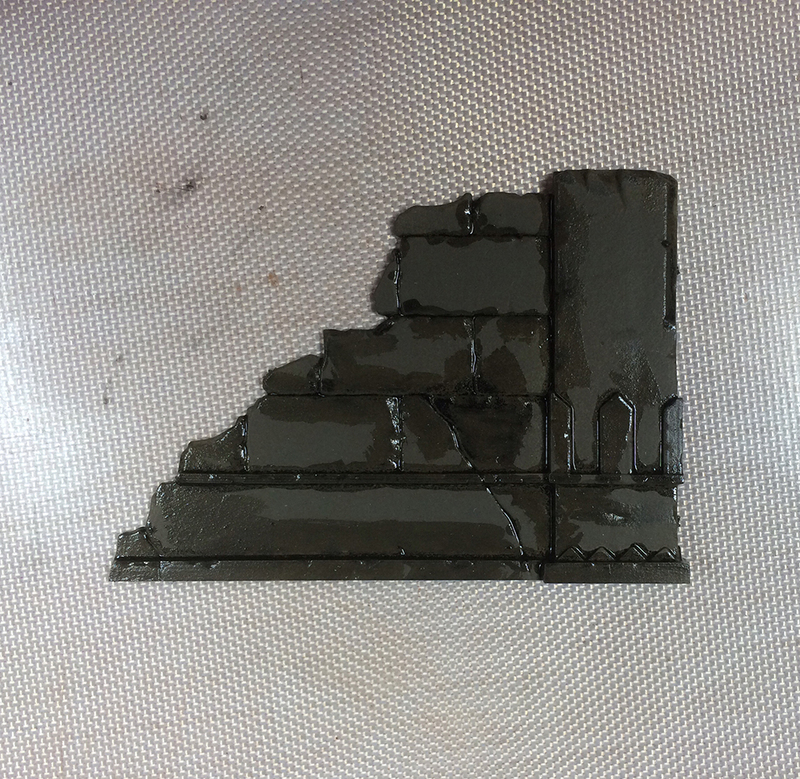 If the tool is too wet it will release solvent all over the model, while too dry won’t be an effective cleaner. Be mindful of how much pressure you apply as well. Pushing and rubbing stubborn areas can breach the varnish. There are a few choices for cleaning tools. The first, and most simple, is a finger. This can work surprisingly well when you don’t want the tool to be absorbent. 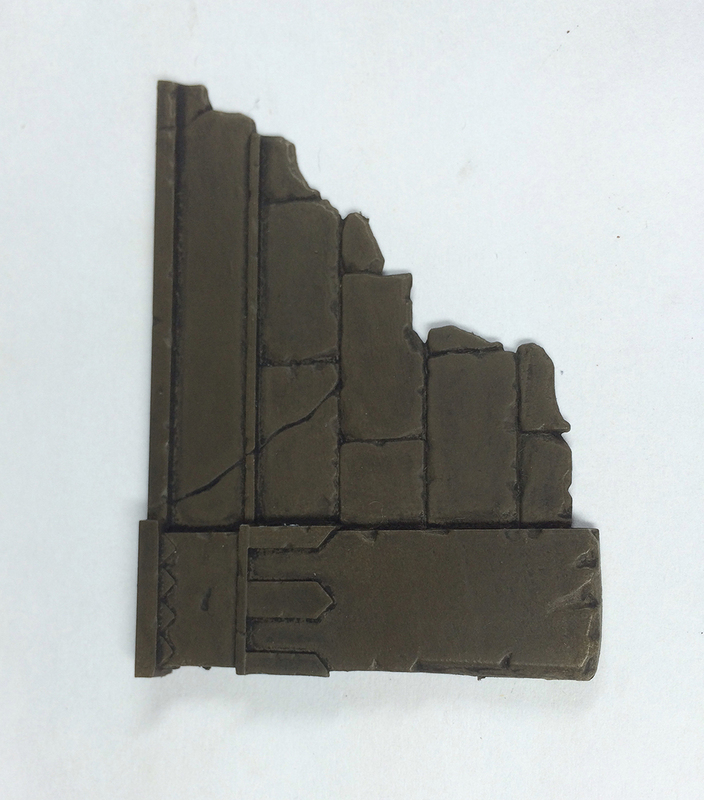 In the ruins shown above the finger works well on flat areas with line recesses. The finger pushes the surface wash away, but won’t reach into the cracks. The most popular tool is the Q-tip. 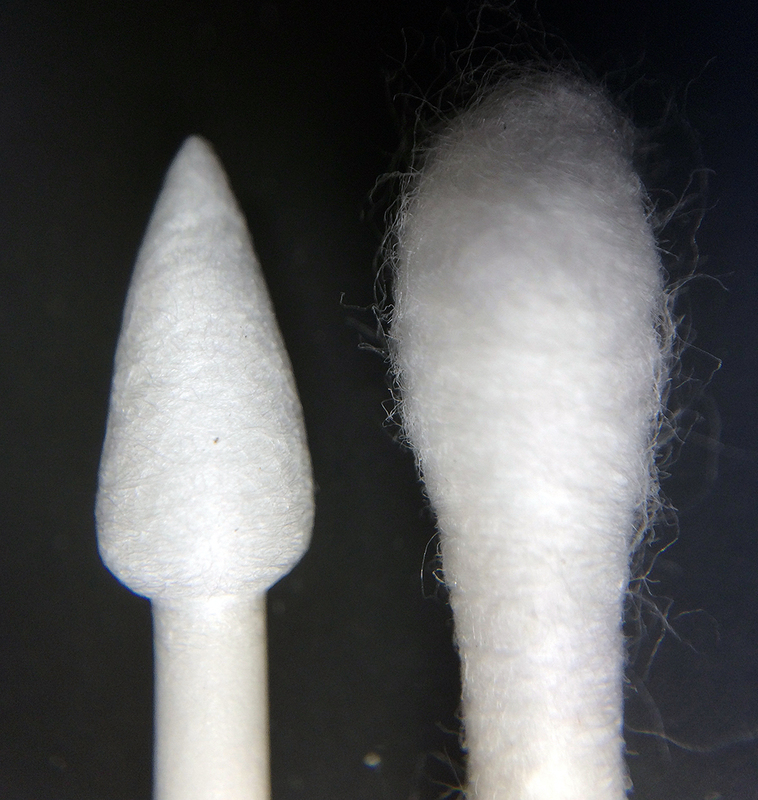 Shown on the right is a typical, store bought Q-tip close up. Notice the stray fibers and the loosely packed head. Consequently, Q-tips are renowned for leaving stray fibers on models. For this reason, a preferable tool in an eye shadow makeup brush, which is essentially a sponge on a stick. The makeup brush acts very similarly, but leaves nothing behind. Finally, shown on the left is a Tamiya precision cotton swab. It is far more densely packed than a Q-tip and comes to a point. These are useful for tricky spots where you need to be particularly tidy. 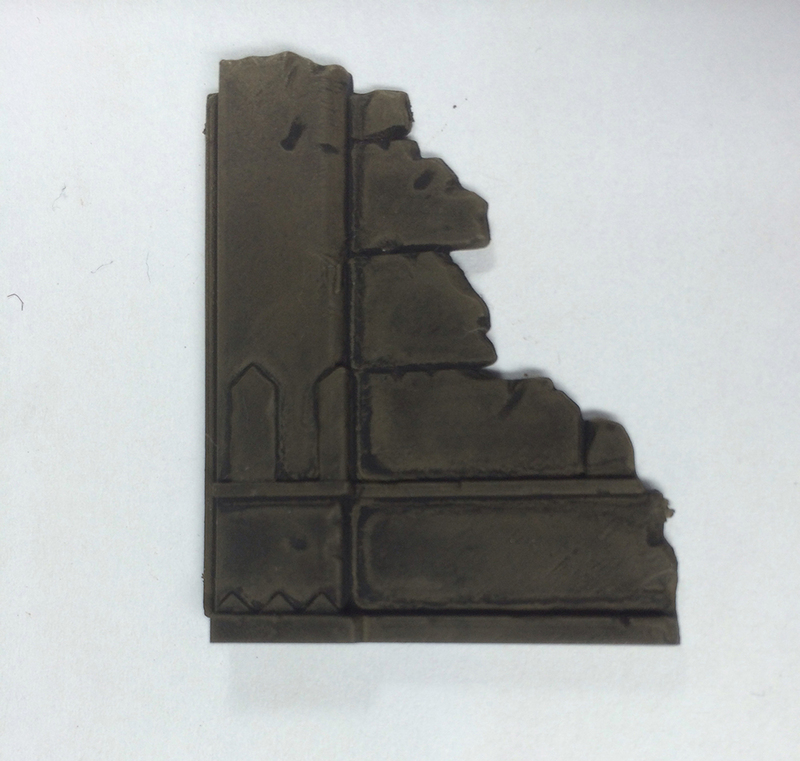 …and the matte sample after cleaning. Note how much of the wash couldn’t be removed. The finished product looks dingy. 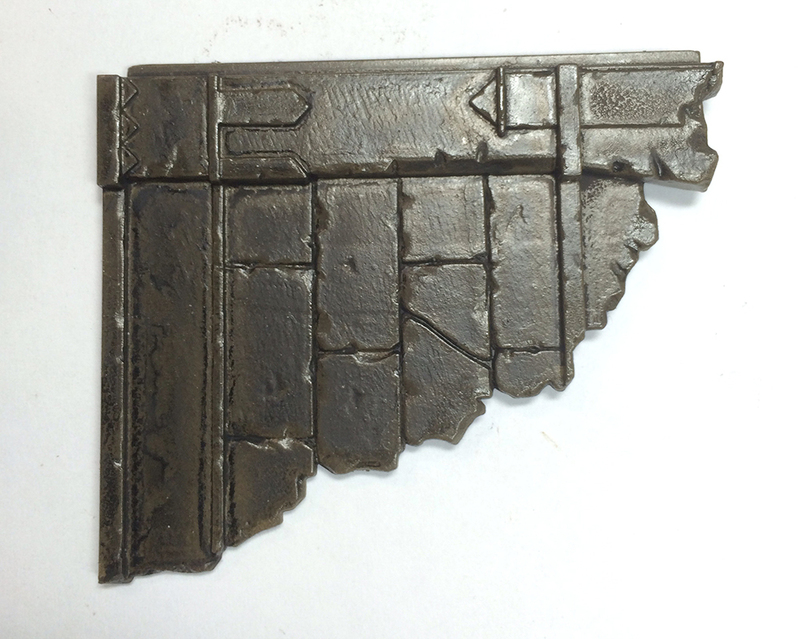 This technique could be useful for weathering, but not for tidy paint jobs. …and after cleaning. The surface is easily cleaned and the remaining wash is soft and transitions into non-washed areas well. This is my preferred method for most models. …and after cleaning. This is even easier to clean than the satin and the shading is more stark and bold. There tends to be little transition in the wash. In addition, it’s worth noting that gloss varnish can be difficult to cover later with satin and often requires multiple coats to take down the shine and reach tough areas. 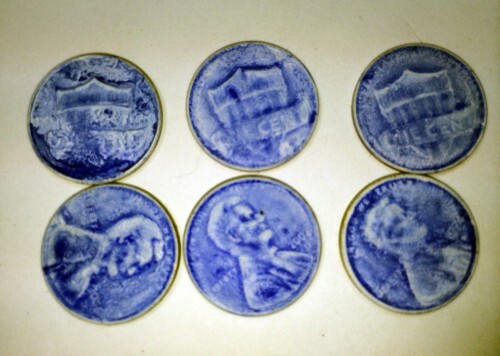 Finally, the coins before cleaning. The gloss coins are left, satin middle, and matte right. All coins were stood upright before drying. Note the pigment pooling at the bottom of the gloss coin. …and after cleaning. 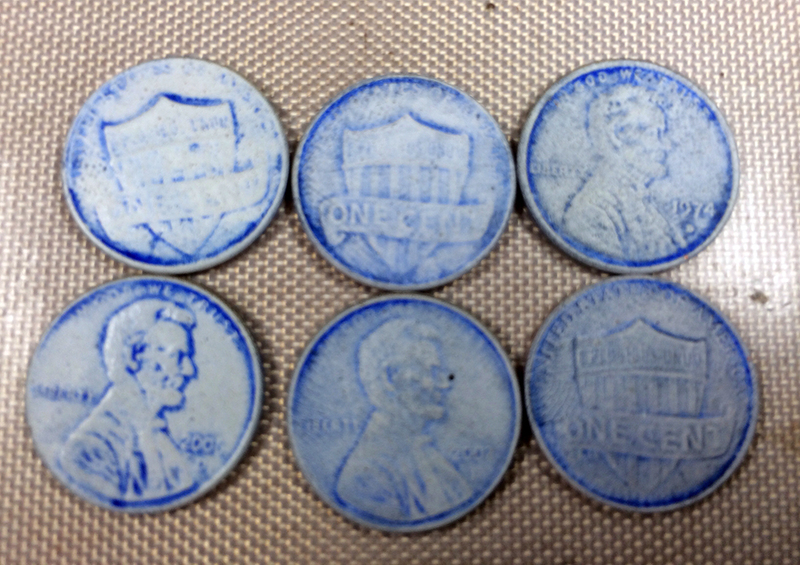 Again note the bold lines on the gloss coin and the gradients on the stain. Also, the gloss coin is the least stained of the three with the white appearing true white. Matte has been the most stained blue. 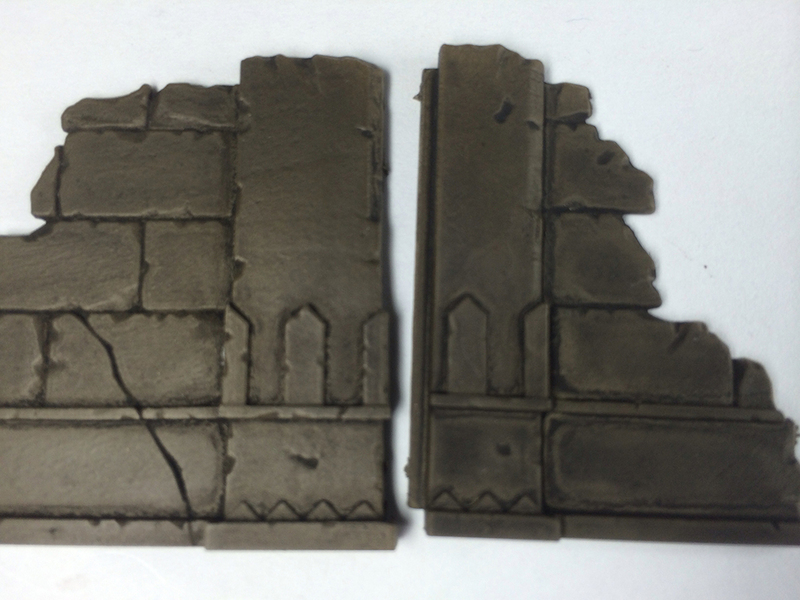 To further illustrate the stain difference, here is the satin ruin next to matte ruin post-cleaning. The matte ruin is darker everywhere, thus creating the “filter” effect. After you’re finished, make sure to let the model dry a day before applying another coat of varnish. Keep in mind that you can repeat the whole oil wash process over and over before varnishing until you get the effect that you want. Furthermore, you can seal the oil wash and add another on top for complex shading. The oil wash process can be tricky and foreign at first (especially the way the wash behaves when wet), but with practice it will speed up painting and give clean results. If you have any questions, feel free to message me or leave a comment. This entry was posted in Painting and tagged painting, Tutorial by Erik Kenneally. Bookmark the permalink. I just had to create a account to thank you for this excellent tutorial!, i´ve been planning to try out oil/enamel washes in the coming week and this is gonna be a big help. I also checked out the rest of the posts of this site and they are really well made and informative, along with some amazingly painted models that serve as a great source of inspiration. Great analysis. 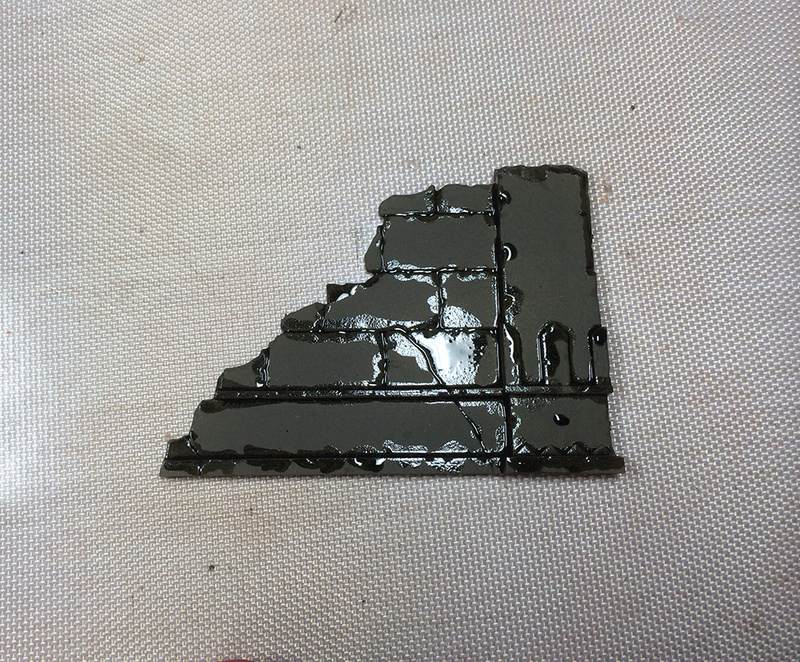 I’ve been been painting 40k, washing with GW Washes – but annoyed at the scuzzy havoc they reek on highlights. Your resullts seem to point to satin varnish is the way to go. Ultimately, I want to end up with Matt varnished figures with a few bits hand glossed. I use an airbrush – Vallejo looks good. Wondered if can I get away with Klear floor polish? Hey Steven, Erik may chime in, but I’ll tell you what I do and why. I’ve found that while there is a difference in behavior with oil washes based upon the varnish coat, it’s easy enough to clean-up the models with a q-tip and some thinner, that I tend to simply use a matt varnish (or none at all) prior to washing. My personal preference is Testor’s Dullcote in a spry can, but you can thin Vallejo varnishes with water. 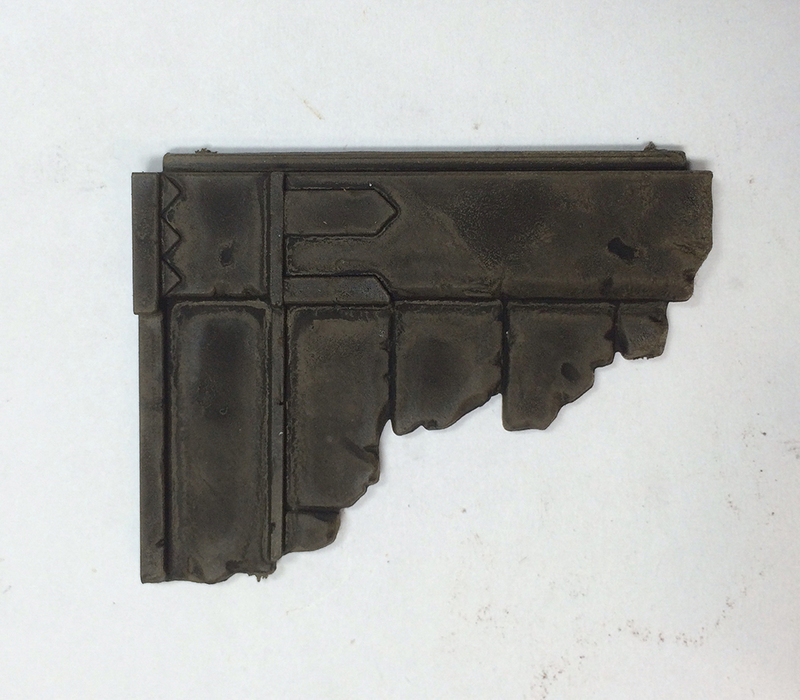 Klear and Future floor are just resins, so in theory they could work just fine, but I’d try it on a model I hadn’t spent hours on first. As Pete said, Testors Dullcote is really good for getting a matte finish. The catch is that it’s made for enamel paint. 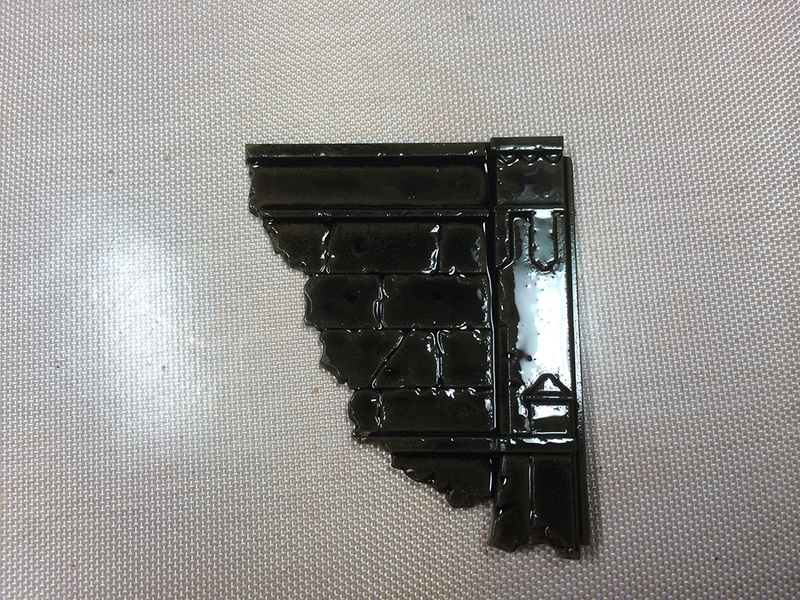 I have a theory that it works well because it actually melts an outer layer of paint. When it re-solidifies, the surface no longer has a smooth surface, causing a matte look. For that reason, I’d avoid the brush on version as it can strip paint. Also, cleaning enamels out of an airbrush is a hassle, so I’d just use the rattle can stuff. It absolutely needs to be sprayed on in very thin coats. Also, keep in mind that it doesn’t do much for protection, so it’s prudent to spray the model first with a gloss coat (I use Vallejo gloss varnish through an airbrush for this, but I may switch to rattle can just out of speed and convenience). I haven’t used the Klear floor polish, so I can’t give advice on that. For brush on gloss, I normally just use Vallejo gloss varnish. If you really want something to pop with gloss, nothing works better that brushing on a coat of Vallejo Still Water. It’s not really made to be used this way and may require a slight bit of thinning, but the results are very glossy. Thanks for your help, thinned Vallejo Satin Varnish did the trick for me. For a thinner, I tried using Winsor & Newton Sansodor as the thinner – but it was super viscose, and seemed to inhibit the flow of oil. Then I tried Artists white spirit, and bingo! Oil washines are such a fantastic timesaver. I will never use Citadel washes again! 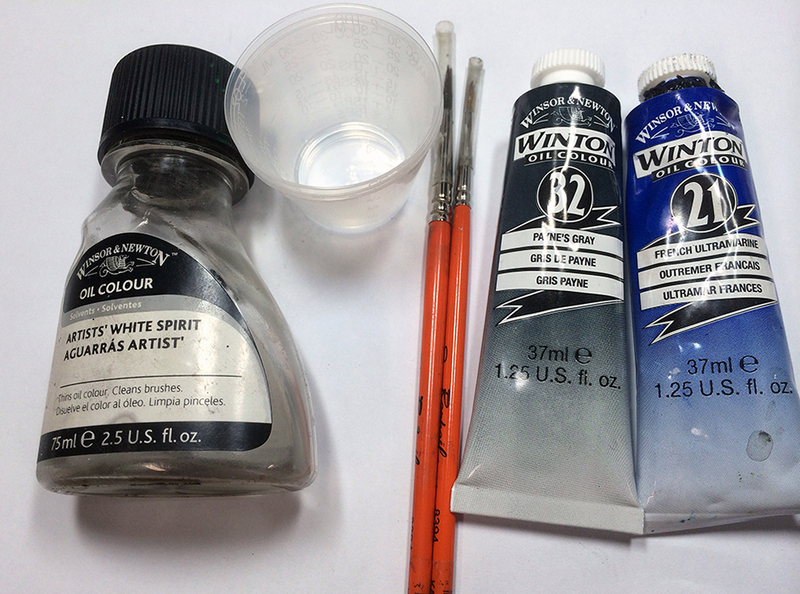 finally – the winton Oils seem a little grainy – is there a better oil paint you recommend? Great article! For oil washing 28mm miniatures, would you suggest using satin varnish over gloss? Thank you for this tutorial; it is clear and informative.